Earlier this month, accomplished sea kayaker Duane Strosaker had the scare of a lifetime just a few miles offshore of Gaviota State Beach. 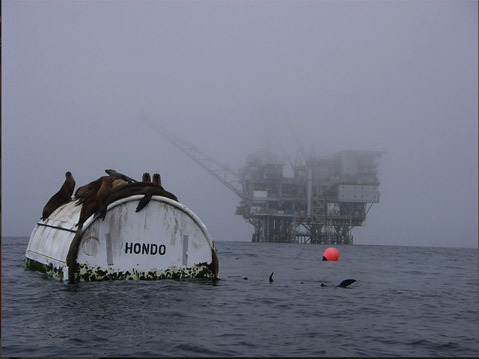 Strosaker had made it his summer-long mission to paddle out to all 23 offshore oil rigs in Southern California in the name of raising awareness about the perils of such ocean-borne oil activity. On his way back to shore from an early-morning excursion on August 2 to the three oil platforms at the western end of the Santa Barbara Channel — the final leg of his paddling pilgrimage — Strosaker had a rather Jaws-like experience with what experts, based on bite marks left behind, believe was a 15- to 17-foot great white shark. According to Strosaker, the shark eventually let go and, after splashing its tail a short distance from his boat, disappeared into the dark depths below. Though it inflicted not nearly as much damage as it could have, the five puncture marks and partially crushed hull left behind by the short-lived encounter forced Strosaker to pump out his boat numerous times on the way back to shore to keep from sinking. Once safely ashore, Strosaker alerted state park authorities about his run-in.